Speaking at the 83rd PDP National Executive Committee meeting in Abuja yesterday, Secondus said Mahmoud needs to resign because he has proven he is unable to conduct free, fair and credible election. On the IG of Police, Secondus said the police under the current leadership is being used as a tool to victimize anyone that is believed to be of the oposition. 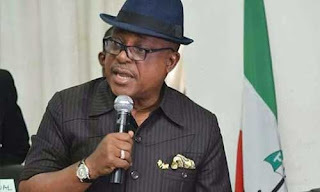 Secondus at the meeting said, "We want to do this advance warning that we are lovers of democracy and peace. We want the peace of our nation; so, let them note all they have done, even in the case of Kwara and Bauchi, where we warned clearly that they announced different results. "That will no longer be acceptable. We therefore call on the INEC leadership headed by Prof. Yakubu to quietly resign because he does not have strong will and courage to conduct free and fair election. He should resign. We also call on the IGP to resign and go because I have never witnessed in the history of our nation, from the First Republic even in the military regime, we have never seen this kind of act and the way and manner the police force have been used by the government of APC against the people. Our people are being killed on a daily basis and as I speak with you, leaders of PDP have been earmarked to be murdered and killed. "The country will rise to defend the values of our founding fathers, and of our democracy. We must defend. We are not afraid. If you want a nation to be rescued from hunger, killings, we must be ready.